For shoulder-season fishermen, the lower Madison is the place to be. From wilderness pocket water to grass-laden side channels, the lower river satisfies any angling itch. The lower Madison starts below Ennis Lake and flows down to Three Forks where it has a little ménage-a-trois with the Gallatin and Jefferson rivers, resulting in their love child, the Missouri River. Access to the lower Madison is a mixed bag with the easiest access being between Bear Trap Canyon Access Road downstream to Greycliff. Bear Trap Canyon offers several miles of roadless wilderness that is only accessible by foot or by boat for the most experienced whitewater navigators. 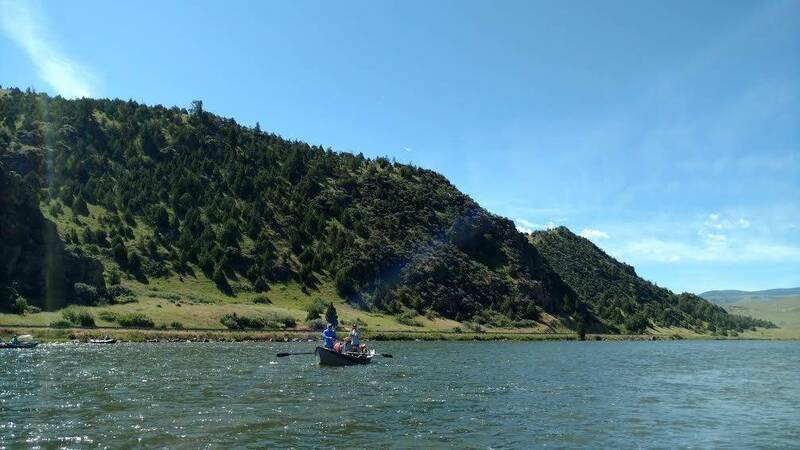 Below Greycliff, there are a few fishing-access sites before reaching Missouri Headwaters State Park. Flows are quite stable in this section because it’s dam-controlled. In spring, flows increase due to runoff, and occasionally, flows increase again in late summer when additional water is released from the dams to help protect fish against high water temps. The lower Madison fishes best in fall and spring. Winter can provide some great opportunities when temps are mild and the wind takes a day off. Summer can be tough as water temps tend to get really toasty and the river between Warm Springs and Black’s Ford is taken over by tubers in swimsuits; a.k.a. the Bikini Hatch. However, if water temps are safe for fish and you find a cool and cloudy window in summer, this could be a great option. Rainbow trout dominate and appear to be thriving while brown trout have been in a major slump for several years now. There is a fair population of whitefish as well. There are ample opportunities for both walk/wade and float-fishing on the lower Madison. Nearly the entire stretch is floatable, with the exception of the first mile or so just below Ennis Dam. Be warned that floating Bear Trap Canyon is not to be taken lightly and should be left to those with extensive whitewater experience. At Warm Springs, the river widens and slows, making this section down to Black’s Ford very popular for novice oarsmen and recreational floaters. Jagged rocks and steep canyon walls surround Ennis Dam down through Bear Trap Canyon. If you like fishing pocket water, this is a great place to be. There is a healthy population of both rattlesnakes and poison ivy in the canyon, so stay alert. From Warm Springs down, the river is more akin to a giant spring creek. This section is almost entirely wadeable and is littered with weedbeds that are home to crayfish, scuds, and other tasty trout snacks. If you’re looking to get away from the crowds, and fish numbers aren’t a priority, you may want to explore the section from Greycliff to the Milwaukee fishing-access site. This section is about 16 miles long and requires a full day. Fishing is fickle, but the views, wildlife, and solitude make it a great option. If you’re not running your own shuttle on the lower Madison, do your homework before you commit, as options are limited. General Montana fishing regulations apply to the entire stretch. The only exception is that there is no limit on northern pike. Always refer to regulations before fishing. Head west out of Bozeman and through Four Corners for about 23 miles until you reach Black’s Ford fishing access. From there you can head north on Madison Rd. (gravel) to gain access to Greycliff and Cobblestone. The gravel road splits, with one branch popping out near Three Forks and the other at I-90 near Logan. Or continue on Hwy. 84 south to Bear Trap Canyon Rd., Warm Springs, and more. Continuing past Warm Springs, jump on Hwy. 287 in Norris and head south toward Ennis where you can gain access to the section just below Ennis Lake by turning onto N. Ennis Lake Rd. (dirt) at McAllister. Jimmy Armijo-Grover is the manager of Gallatin River Guides in Big Sky.